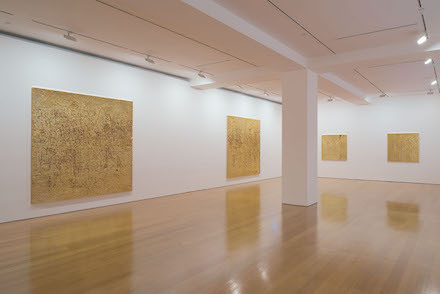 On view at Gagosian Hong Kong is an exhibition of recent paintings by Rudolf Stingel, representing the Italian artist’s first major exhibition of work in Asia. Exploring the nature of memory and the relationship between artwork and artist, Stingel continues expanding the vocabulary of painting with this series of work. Stingel was born in 1956 in Merano, Italy, and he currently lives and works in both New York City and Merano, Italy. His body of work often focuses on a palpable rendering of the passage of time: melancholic self-portraits that bear the traces of time in the studio, and are often executed in a massive scale, stretching from floor to ceiling – such as his floor and wall carpet installations. 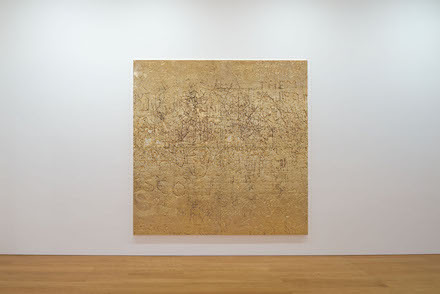 On view in the exhibition are a series of panel paintings, cast copper and electro-plated gold surfaces bearing a dense series of etchings, markings and carved out texts resulting from repeated marks by passerby. The works are abstract and seemingly luxurious, representing great wealth, yet they are created from humble materials and banal gestures. The works original origins stem from his environmental installations at the Museum of Contemporary Art, Chicago and the Whitney Museum in New York in 2007. 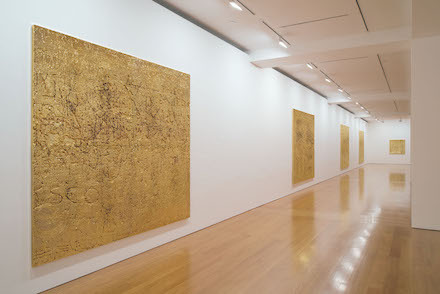 In each of these works, Stingel transformed the spaces by covering the walls with a layer of aluminum-faced Celotex, inviting viewers to scratch, write, and mark the surface at will. Eventually, the walls turned into a mass of anonymous graffiti-esque marks. Stingel then cast and plated large sections of the panels, in order to memorialize the effects of time. The works displayed currently at Gagosian are selected fragments from the series, a move that further interrogates the limits of memory and time within a space. A distinct absence is felt in the spaces between each work, and the lack of coherence, as some words and images trail off the surface and disappear, makes the work’s removal from its original location all the more immediate. One gets the sense that they are viewing a series of isolated, physical memories. Cast from a single origin, but broken into works by their disjunctive treatment of time, space, and gesture. 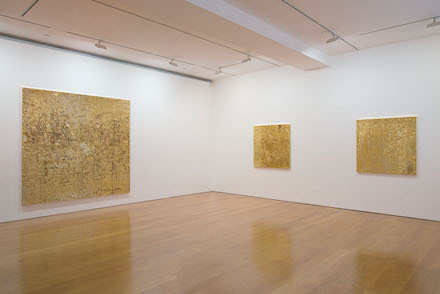 The current exhibition will remain on view at Gagosian Hong Kong through May 9, 2015. This entry was posted on Monday, April 6th, 2015 at 12:00 am	and is filed under Art News, Featured Post, Show. You can follow any responses to this entry through the RSS 2.0 feed. You can leave a response, or trackback from your own site.